Bearing in mind the Louder Than War slogan ‘we are punk’, surely you can’t really get more punk than putting out an album of rollicking banjo tunes. Although Damien and Ron doesn’t quite have the ring of Rotten and Vicious, they’re a notorious and wily pairing. Damien O’Kane – best known as the musical and life partner to folk goddess and Yorkshire legend Kate Rusby. Ron Block – best known for his role with American bluegrass country legend Alison Krauss and Union Station. You can see the billing – ‘together at last’. Over the past 4 years, Damien’s solo output has suddenly flooded out. His more recent work has displayed a savvy and contemporary edge – the days of The Mystery Inch (still needs explaining to me although I have an inkling), the organic guitar/banjo album with David Kosky from 2011, seemed to have been swallowed into a more electronic and electric experimentation. Banjophony takes things back to the future. However, don’t just think it’s about two guys in a bout of seedy banjo indulgence in the studio. A gang of compadres add their weight to the cause; in the main, Damien’s usual buddies Stephen Byrnes (who plays a significant part on the arrangement front) and Duncan Lyall offer cameos and beyond while Michael McGoldrick is on hand again, seemingly carrying his whistle round with him in his back pocket only to suddenly appear like the shopkeeper in Mr Benn. Packed with fifteen tunes that showcase the different styles and cultures and that shift from the rip rollicking to calmer airs and a touch of melancholy to sooth the soul, Damien takes honours for another outpouring of original tunes while the duo get their heads together for a couple of shared tune sets. Jumping in at the deep end, proceedings are opened with the swashbuckling combo of Ron’s Miller’s Gin and Damien’s Potato Anxiety (great to see how these guys get inspiration for the titles when there isn’t a lyric or handy chorus for reference) give way to another boisterous outing in Lucky Rogues / Frantic Inspiration where the bit players add their contributions for all they’re worth. Perfectly sequenced and if you weren’t up for swinging your pants to a banjo tune or two, you are now. Perhaps ‘the one’ that emerges from the ‘pant swingers’ is No Harm Done, that would surely have even the most stony faced folk stalwart indulging in some English chair dancing while those less inhibited will be making the festival tents bounce. Ron’s Battersea Skillet Liquor straddles the Atlantic like a giant Rod Stewart, a quite noticeable change of direction and while they may refer to the title track as banjo rock and roll, it sure has a bluesy feel sewn into its fabric. The duo certainly have plenty to say; the floodgates open for well over an hour of music as guitar and banjos intertwine and interplay, dusted off with a sugar coated touch of fiddle or whistle, and while the O’Kane/Block banjos dominate, spare a thought for Sierra Hull’s mandolin; something to start to listen out for as you get accustomed to the mass of tuneage on offer. David Kosky earns a recall too, deservedly allocated the honour of closing the album with a tune that seals the show with a gently reflective moment. 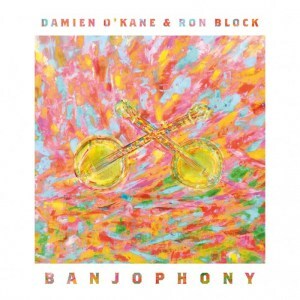 Damien might have jokingly threatened the banjo death metal album, but Banjophony is more about a rebellious punkishness. Despite the noble instrument earning the ‘high school chick repellent’ term from Ron, along with Jamie Francis from Sam Kelly’s Lost Boys, Ron and Damien are flying the flag for making the banjo even cooler and even sexier.